We went to the local registration office (Matični Ured) to file documents (our birth certificates, the certificate of marital status, a copy of my passport, copies of our witnesses) together with a request for marriage registration, which you can obtain at the local registration office. 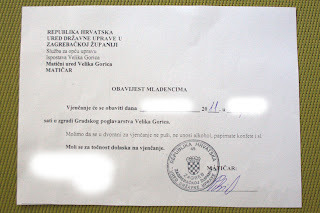 If you plan to have your wedding ceremony at the local government office, you need to pay 300Kn together with an issue fee of an marriage certificate (Izvadak is matice vjenčanih), which will be given to you on the wedding day. When we filed the request for marriage registration, the staff at the registration office asked us simple questions such as "Will this be your first marriage? ", "How would you like your surname to be after the marriage" and so on. If you are non-Croatian and plan to have a wedding ceremony at the local government office, you need to accompany a court translator. If you have already appointed a court translator by the time you file the documents, then you need to provide information about your court translator. If you haven't found one yet, you need to inform the registration office later about the court translator when you find one. Also, you can ask the registration office about the court translator. In fact, we asked them who to contact. Upon filing of the request for marriage registration, the registration office asked us when we wanted to have our wedding ceremony. Usually, it seems like you can pick up any day but a month later after the filing day. So, you need to talk to your witnesses, your guests and and your family beforehand to coordinate schedules. After everything was set with the registration office, we received a notification on marriage day. By the way, some churches give you a wedding ceremony in English. So, if you choose to have your wedding ceremony in such church, there is no need to hire the court translator.